Basshunter (real name: Jonas Erik Altberg; born 22 December 1984 in Halmstad) is a Swedish singer, record producer and DJ. 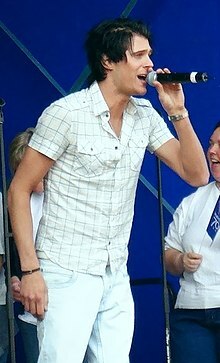 He competed in the 2010 UK version of Celebrity Big Brother, finishing in 4th place. ↑ Mendoza, Nadia (2008-07-15). "Basshunter lothario Jonas Altberg was bullied". The Sun. Archived from the original on 2011-05-25. Retrieved 2017-10-09. ↑ "Grammisvinnare 2008" (PDF) (in Swedish). grammis.se. Archived from the original (PDF) on 17 July 2011. Retrieved 29 April 2016. ↑ ""Idol"-Ola het inför Rockbjörnen" (in Swedish). st.nu. 8 December 2006. Archived from the original on 22 February 2014. Retrieved 6 February 2014. ↑ "AWARD 2006". eurodanceweb.com. Archived from the original on 2 April 2014. Retrieved 30 September 2014. ↑ "Basshunter ja Juanes Helsingin – NRJ Radio Awards -gaalaan" (in Finnish). findance.com. 22 December 2006. Retrieved 1 September 2012. ↑ "European Border Breakers Awards – nagroda dla artystów, którzy odnieśli sukces poza granicami swego kraju" (in Polish). zpav.pl. 16 January 2008. Archived from the original on 13 November 2011. Retrieved 6 February 2014. ↑ Łukasz Szewczyk (25 April 2008). "Eska Music Awards 2008 rozdane – Feel hitem roku" (in Polish). media2.pl. Retrieved 6 February 2014. ↑ Duncan Geere (17 September 2008). "BT Digital Music Awards – nominations announced". techdigest.tv. Retrieved 6 February 2014. ↑ "MTV Europe Music Awards 2008" (in Polish). ema.mtv.pl. Archived from the original on 29 August 2008. Retrieved 6 February 2014. ↑ "In 2008 I think the best is:". roty.tv. Archived from the original on 17 February 2009. Retrieved 27 February 2014. ↑ "BASSHUNTER". awardsandwinners.com. Retrieved 29 May 2014. ↑ "THE SCANDIPOP AWARDS!". scandipop.co.uk. 2 January 2009. Retrieved 6 February 2014. ↑ Ron Slomowicz "DJ Ron Slomowicz". "2010 International Dance Music Awards at WMC – Winners Announced". dancemusic.about.com. Archived from the original on 7 June 2012. Retrieved 6 February 2014. ↑ "THE SCANDIPOP AWARD 2011: THE NOMINATIONS!". scandipop.co.uk. 14 December 2010. Retrieved 6 February 2014. Wikimedia Commons has media related to Basshunter. This page was last changed on 13 April 2019, at 14:01.